Whenever I arrange to meet friends in Manchester for brunch, lunch or dinner (or even just a coffee catch-up) I always think of the Northern Quarter first. There is just something about how cute, quirky and individual the place is for pretty much everything, from shopping and socialising, to dining and drinking. About a week ago, I received news about one of my old-time Northern Quarter favourites recently undergoing a refurbishment. 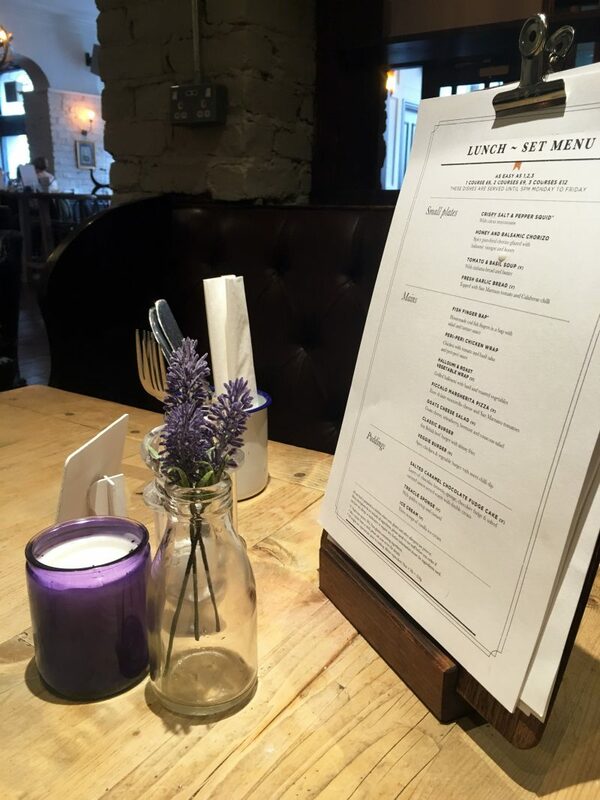 The English Lounge is situated across from the market side of Manchester Arndale, close to Suedehill and Piccadilly, boasting a friendly and traditional appearance pub and eatery for those coming to the city centre. Rather than playing on the unique, off-the-wall vibes that other NQ hotspots do, The English Lounge takes a more classic, homely approach. From the outside, it looks like a traditional pub which would play home to cask ales and home cooked dinners, and I’m glad the refurbishment hasn’t changed this. However, when you step inside, the interior has been modernised to reflect the fashionable hub of the area. 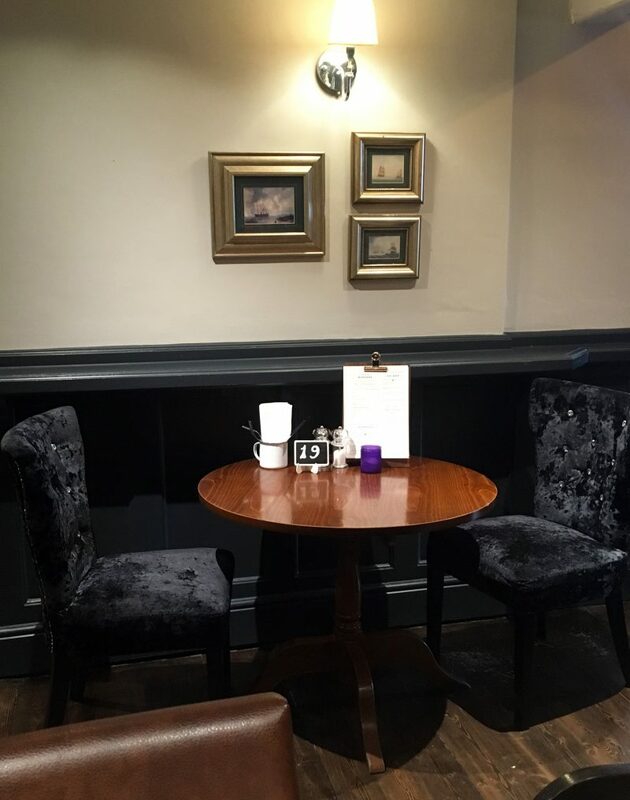 It’s now a brighter, airier pub, with dark wood touches from the bar, stools and high topped tables, perfect for enjoying a pint or a glass of wine. Giving it a warmer and inviting feel, there are splashes of red leather and exposed brick features, and deep blue velvet chairs with clean walls. I spied lots of interesting wall art in premium looking frames, not to mention copious amounts of games and retro activities boxed away in trunks! I came here with two of my friends to enjoy a spot of 1pm lunch, in which we were taken to a fresh pale wood table in a very cosy corner. 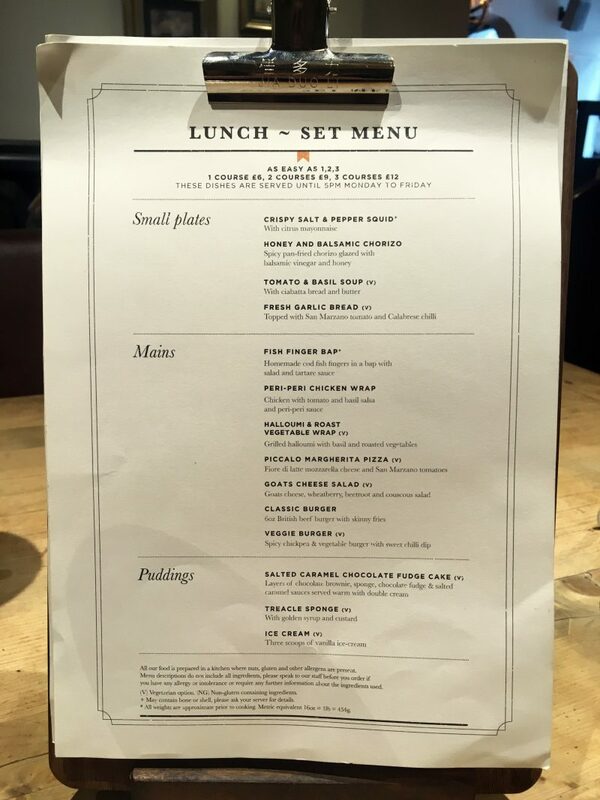 The menus boasted a lot of choice, but we focused more on the dedicated lunch time menu as it had cleverly hand-picked what our eyes (and bellies) were aiming towards anyway. The English Lounge offers a range of hand stretched, artisan pizzas with melted mozzarella, rustic tomato sauce and a choice of toppings such as prosciutto and olives; sirloin and gorgonzola; or smoked salmon, ricotta and capers. Burger fans can enjoy 100% beef patties served in satisfying combinations including venison and blue cheese; chicken, guacamole and bacon; and three cheeses topped high with a juicy beef burger, all nestled in a toasted brioche. Or, there are those all-time pub favourites, such as beer battered fish and chips, prime steaks and legendary Sunday roasts. 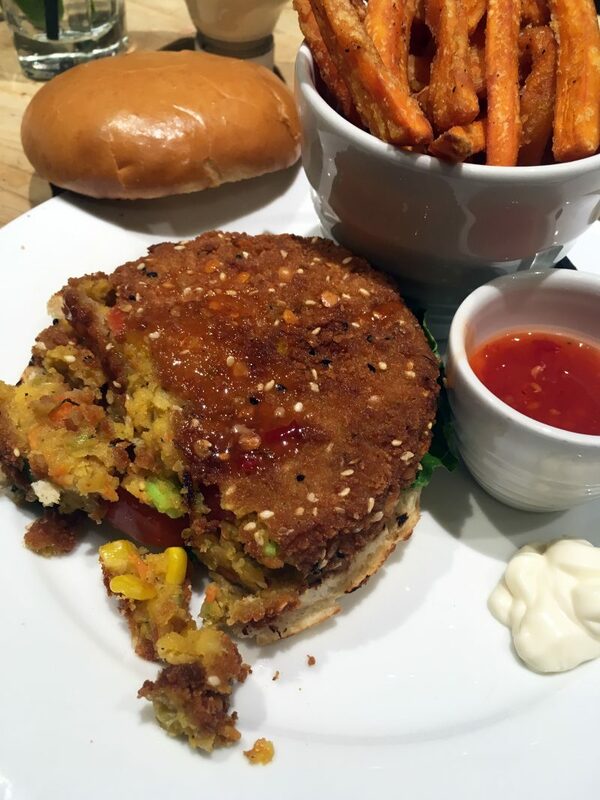 I opted for the spicy chickpea burger with chunky sweet potato chips, which was delicious. I’m not a vegetarian, but I do love a tasty veggie burger, and this spiced chickpea version jumped out at me. My two friends went for a slightly lighter option and chose the Peri Peri Chicken wrap, along with sweet potato fries too. I’d be extremely disappointed if I was turning up at a pub or restaurant to order food, and they refused my option to upgrade to sweet potato fries, it’s literally the norm for me now! And it’s rude to not opt for a dessert- right? Especially when trying out a new menu! I chose to be pretty naughty and ordered the Salted Caramel Chocolate Fudge Cake, which I can’t even begin to explain how incredible it tasted. 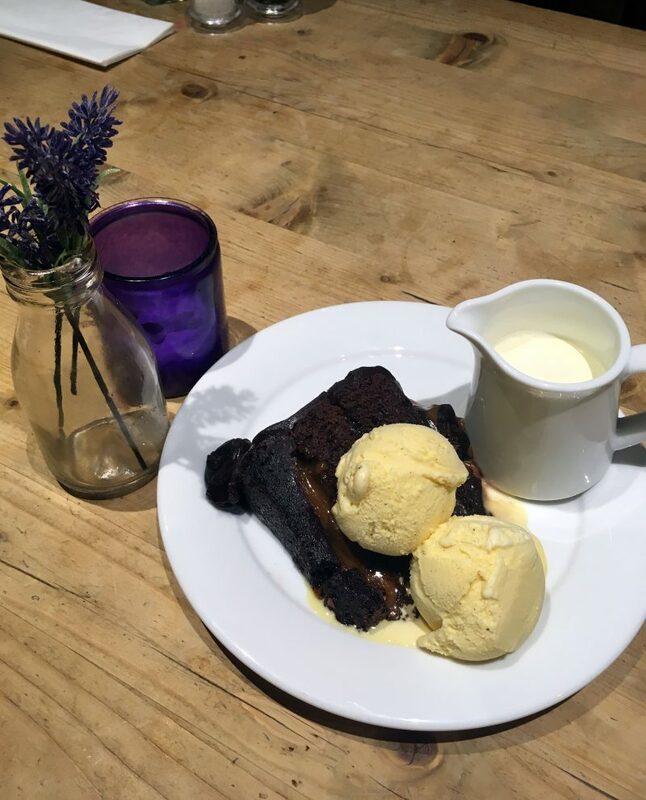 It featured layers of chocolate brownie, sponge, chocolate and salted caramel sauce, fudge and dollops of creamy ice cream. My mouth is watering even thinking about how delicious it was! Due to dining there in the day, I didn’t allow myself to indulge in alcohol, but I did take a look at the drinks scene. Beer drinkers can enjoy local craft ales, spirit lovers can experiment with their enviable gin selection, cocktail sippers can chose from an extensive list of cocktails, and of course, I spied some fine looking wines! I had a little browse upstairs too which is a newly opened area allow private functions, and a quieter room to dine and drink. I also spotted an outdoor terrace, which will be perfect when Summer arrives! I’d highly recommend this little NQ gem for a casual, laid-back day time catch-up, or as a starter place for a fun filled Saturday night. Prices are reasonable, the ambiance is warm and friendly, and you’ve got the rest of the bustling NQ on the doorstep!